In the north-eastern district of Larnaca, distinct from the surrounding building, there is the imposing monument of the Catholic Church of the Franciscan Fraternity dedicated to the "'The Virgin Mary of the Graces". This year 1993, the church distinguished especially for its architecture, completes 150 years from its foundation. In the Monastery of the church there are two monks in residence, while in the adjacent Convent there reside six nuns. In the large compound of the Church there is also an Old Peoples Home belonging to the Church and administered by the monks. We spoke to the Abbot of the Monastery. Father Marcus, about the history of the Church. Father Marcus who is Chilean, came to Cyprus about 12 years ago has now been in Larnaca for the last year. Father Marcus, in his broken Greek and with typical monastic simplicity and courtesy, invited us to view his most beautiful church. The Franciscans are located in Larnaca since the year 1593. The Church is the third in a series of three built on the same site. Very little is known about the first. But this is sure that with the passage of time it became unsuitable for worship. So in 1724 the erection of a new Church became imperative which was however again put off. In the course of a century from the building of the second Church, it was decided to demolish it and to rebuild a new one, the third. 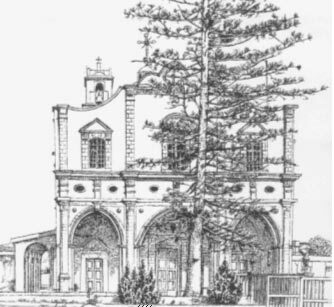 The foundation stone of the third church was blessed on Sunday 10th July 1842, in the presence of the Diplomatic Corps then established in Larnaca. After six years work the new Church was consecrated officially and with celebration on the 8" December 1848, by Father Bernardino Trionfetti, the Principal Abbot of Terra Santa. The Church is built in the shape of the Latin cross. It has three narthexes, dome and Peristyle (colonnade) built-in its face. The architect of the church, the Franciscan Brother Serafino Da Roccascelima designed the church inspired by the ecclesiastical architectural art of southern Italy particularly that of the 17th and 18th centuries. The belfry in the shape of a square tower has no special detail interest but its face, of exceptional style is impressive. The architect Roccascelenia is commemorated in an inscription in Latin, carved on the front of the main window of the face and also a bust of marble set inside the Peristyle. The bust was carved in Tuscany Italy, following a commission from the procurement committee of Larnaca, who in this manner wished to express their appreciation and gratitude to the man who enriched their city with such an imposing monument, regarded by historians of the period as characteristic and of great historical value. The church since its inception has drawn the attention and interest of visitors to Larnaca for its superb architecture and the valuable original touches it enjoys. European travellers and historians who have visited Cyprus and especially Larnaca, from time to time, have commented favourably disposed remarks on the Church of The Virgin Mary of The Graces, known as Terra Santa a building worthy of note.